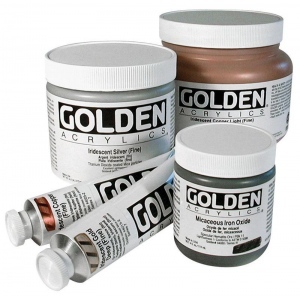 These acrylics offer highly reflective metallic variations when mixed with Golden colors. * The iridescent colors achieve their reflective properties by synthetically reproducing nature's pearlescent qualities found in fish scales or the dust of a butterfly’s wing. * Coarse iridescent colors are large particle size versions of fine iridescent products.